These images are provided as examples of what are considered as ANA-negative as viewed under a microscope. Since a negative ANA can be represented by a number of different images, it should be clear that AC-0 should not be regarded as the definite example but used for comparison purposes only. The guiding feature that links these variable possibilities is the absence of a clear-cut staining in any given subcellular structure. This definition is both subjective and semi-quantitative at best. There should be a discussion regarding how ANA-positive vs ANA-negative cut-off is determined. There are general consensus that such cut-offs should be determined experimentally and locally with normal population controls. The cut-off is highly dependent on the HEp-2 substrates used by individual laboratories, including factors specific to HEp-2 slide manufacturers and lot-to-lot variations, fluorochrome conjugated secondary antibody reagents, microscope and camera settings, serum dilutions, and other variables. In viewing these AC-0 images online using a computer screen, note that the screen default brightness setting may vary from computer to computer and some adjustment may be necessary for appropriate interpretation. For computer with two screens, the brightness for both screen is not necessary in sync either. These AC-0 images are selected to show some definition of cells, including cells in metaphase. If one cannot see sufficient details, probably the screen brightness is set too dark. On the other hand, if these images show too much green staining, please consider the screen brightness is set too bright. In summary, viewers of these images on computer screen should make appropriate adjustment in their screen brightness setting accordingly. Please note that when these AC-0 images are downloaded and viewing with PC/Mac computers, there may be additional variations depending on the image viewing software, in addition to screen brightness setting as discussed above. Herold M, Klotz W, Andrade LEC, Conrad K, de Melo Cruvinel W, Damoiseaux J, Fritzler MJ, von Muhlen CA, Satoh M, Chan EKL. International Consensus on Antinuclear Antibody Patterns: defining negative results and reporting unidentified patterns. Clin Chem Lab Med. 2018;56:1799-802. Nuclear periphery positive and yet center negative? Some time we observed periphery of the nucleus is stained like positive and center of the nucleus is negative.what is the reason for that ? The nuclear envelope patterns (AC-11 and AC-12) present a distinctive staining of the peripheral border of the nucleus in interphase cells unaccompanied by staining of mitotic cells where the nuclear envelope has broken down. In addition, there may be a faint staining across the interphase nucleus, representing the overlying nuclear envelope. Other than the autoantigen targets represented by AC-11 and AC-12, we are not aware of any other autoantigens that are exclusively located at the periphery of the HEp-2 cell nucleus. 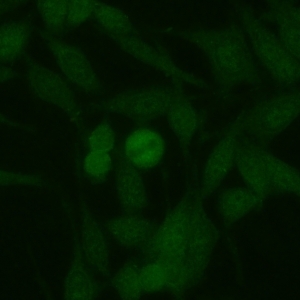 Occasionally, some samples yield a nuclear homogeneous staining (AC-1) with a slight enhancement in the vicinity of the nuclear envelope. In our experience, this finding is not consistently observed when we test the sample in other HEp-2 slide brands or with a different lot of the same brand. 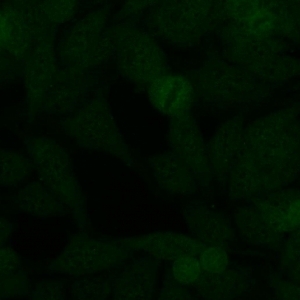 This observation indicates that this particular fluorescence distribution may be an artifact from cell culture and fixation conditions. One other possibility is the artifact caused by accidental drying of the cell substrate during the incubation steps of the IFA procedure. Double IFA protocol. What is the protocol for double IFA that can help to identify, for example, a subcellular compartment such as the nucleolus? Many typical HEp-2 kits come with a fluorescein isothiocyanate (FITC) conjugate such as goat anti-human IgG. For the double immunofluorescence IFA procedure, you need a fluorescence microscope fitted with exciter and barrier filters that are suited to multi-color imaging. In addition, a monoclonal or polyclonal antibody directed against a protein that is specific to the subcellular compartment you are interested in, will be required. This animal antibody will be the tracer for that subcellular domain. If we take the nucleolus as an example, then you need an antibody against a nucleolar protein (e.g. fibrillarin, nucleolar phosphoprotein B23, etc.). 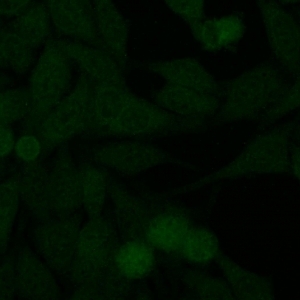 Let's say you can obtain a commercially available mouse monoclonal anti-fibrillarin IgG antibody. Most commonly, you will need a red fluorochrome (e.g. 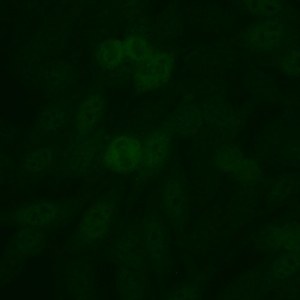 rhodamine or Alexa586) conjugated goat anti-mouse IgG to differentiate this from the human anti-nucleolar antibody stained with FITC. It is important that the fluorochrome against mouse IgG is different from FITC and the light signal does not overlap in excitation/emission/barrier filter spectrum used for the FITC conjugate. For the procedure, in the same HEp-2 well, you will incubate the human antibody and the mouse monoclonal anti-fibrillarin antibody. Both should be at a dilution that yield a good fluorescence signal. It is advised that you first optimize the reaction with the monoclonal antibody. 3)	Mix of both the mouse monoclonal and human antibody, taking into account that dilution for both is now effectively reduced by one-half ==> wash ==> mix of the two conjugate secondary antibodies at appropriate dilutions ==> wash ==> mounting media and coverslip. In some protocols, it is often helpful to counterstain with DAPI (blue stain). Which of the above 3 options to use may or may not be important. One may work better than the others depending on the specific antibodies you will use. If one method doesn't work well, try the others. You will then be able to see the same field in the microscope under the filters for each of the fluorophores. That will tell you if your human primary antibody stains the same subcellular domain as the monoclonal antibody. It is obviously an advantage to take high resolution photographs of the same field of view and then overlap the images using an image processing program such as Adobe PhotoShop as needed. Cytoplasmic positive alone is ANA positive or negative? Hello, I would appreciate if you can share with me how to report cytoplasmic staining (without nuclear staining) as ANA positive or negative? This is an issue that the ICAP committee has discussed extensively but there has been no consensus to date. In many countries, sera showing cytoplasmic staining alone are considered ANA test positive, while in other countries, such sera are considered ANA-negative but cytoplasmic positive. In other jurisdictions, cytoplasmic staining is not reported at all because it is not strictly definable as nuclear staining. There is wide agreement that, sera with cytoplasmic staining alone should not be ignored (1). Other discussions on the topic has suggested renaming he ANA test as anti-cellular antibodies (1), which is consistent with the nomenclature that ICAP has chosen for the various IFA patterns (i.e. AC = anti-cellular). How you report this remains somewhat a local issue. However, whether it is identified as ANA positive or negative has implications for some disease classification criteria. ICAP is working towards a consensus recommendation in the coming year. N. Agmon-Levin, J. Damoiseaux, C. Kallenberg, U. Sack, T. Witte, M. Herold, X. Bossuyt, L. Musset, R. Cervera, A. Plaza- Lopez, C. Dias, Sousa M. Jose, A. Radice, C. Eriksson, O. Hultgren, M. Viander, M. Khamashta, S. Regenass, L. E. Coelho Andrade, A. Wiik, A. Tincani, J. Ronnelid, D. B. Bloch, M. J. Fritzler, E. K. Chan, I. Garcia-de la Torre, K. N. Konstantinov, R. Lahita, M. Wilson, O. Vainio, N. Fabien, R. A. Sinico, P. Meroni, and Y. Shoenfeld. International recommendations for the assessment of autoantibodies to cellular antigens referred to as anti-nuclear antibodies. Ann.Rheum.Dis. 73:17-23, 2014. ANA titer reporting. We would also like recommendations on the report of ANA results. For example, when report such as 1:80 dilution AC-1 homogeneous 4+ are made, is it correct to report in crosses (e.g. +++) or only the dilution and the pattern? A dilution of 1/640 is suggested as the minimum requirement. Some laboratories do not dilute beyond 1/640 for logistic and budgetary considerations, while others who use some automated ANA IFA technologies will obtain digitally calculated end point titer results. It is not true for the full spectrum of HEp-2 IFA (ANA) patterns described by ICAP. The most obvious example is the nuclear dense fine speckled pattern (AC-2 pattern) that has been shown to occur at high titer in the general population (1), but uncontrolled experience suggest the same is true for Golgi, centrosome, and some other cytoplasmic patterns. A point in time ANA is not really that revealing on its own. What is more important to know is whether titers are decreasing, increasing or staying the same over time. Mariz HA, Sato EI, Barbosa SH, Rodrigues SH, Dellavance A, Andrade LE. Pattern on the antinuclear antibody-HEp-2 test is a critical parameter for discriminating antinuclear antibody-positive healthy individuals and patients with autoimmune rheumatic diseases. Arthritis Rheum. 2011;63:191-200.